I believe that race, class, gender, sexual orientation, national origin, gender expression, language or any other variable should not limit any individuals access to midwifery care. 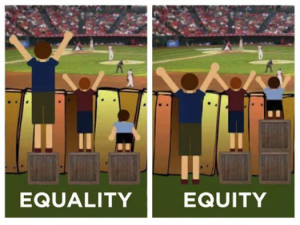 I believe that the difference between Equity and Equality is crucial to understand and that we must all strive for Equity. I believe that not all people who are born in a genetically female body feel connected to the gender expression of female and that the same applies to genetically male persons as well. All of these people deserve care that is compassionate, respectful and of high quality. These are hallmarks of midwifery care and therefor midwifery care is an essential option for these folks. I believe that opening the midwifery umbrella of inclusivity does not diminish or marginalize those already covered under the umbrella, it simply makes more room for everyone to be welcome. I am a Midwife and I will work to incorporate all of these concepts into my care. I am a Midwife and I will work to make midwifery care available and accessible to all people. I am a Midwife and I will work diligently to affect change and support others on their paths to wellness and wholeness, in whatever shape that means for each individual. How do these statements make you feel? Do you agree or disagree? What do you do in your practice to incorporate these philosophies? Thank you for posting this! I agree 100%. This is a concern that is so very important to me, and close to my heart. As midwives, I believe it is crucial that we constantly strive for inclusivity and equity… I love working with all types of families, and have happily welcomed LGBTQ couples, surrogates, poly families, trans and gender queer folks into my practice. You said it so well: EVERY BODY deserves loving, respectful, positive, high-quality care. Thank you! Rock On! I am so glad to have such positive feedback on this issue. I agree. As someone who is able, I feel there is equity in my paying what I can while others with different circumstances may pay less. I’m also proud to share a waiting room with people who may have different gender identity or expression than myself. Everyone deserving dignified, quality care is not a difficult concept to understand; it takes nothing from me to extend that to others.